When you’re in Hazlet, you can’t help but notice the beachfront community, New York City skyline right across the water, and the many opportunities to enjoy the tourist activities in the city. Six Flags and the Animal Safari are a quick drive as well. Hazlet is a popular location with great accessibility. But living in the center of such activity comes at a high price. Those two words describe much of life in northern New Jersey. High price for basic products and services. Some of the highest property taxes in the nation. Expensive transportation and housing costs. You name it, it’s not cheap. And over the last few years, the area has taken a beating from Nor’easter storms and uncommonly heavy snowfall. The hardest hit are of course the elderly and low-income families. They’re working harder than ever and falling even further behind. Many live in homes that were originally built to only be summer bungalows. The repairs, the maintenance, the cost is just too much. That’s where Group Workcamps and you come in. You will be serving alongside our long-standing local partner from Keansburg. The people of Hazlet need us to sweep into town, bringing along the hope, help, and energy that only followers of Jesus can bring. Hazlet has some great activities nearby! Enjoy some sunshine at the local beach, or ride go-karts and other attractions at Keansburg Amusement Park. If you’re willing to drive an hour or two, take a trip to The Big Apple and see all the sights of New York City! We recommend a walk through Central Park, the Top of the Rock Observation Deck for the best views of the city, and a ferry ride to see the Statue of Liberty. For the real thrill-seekers, Six Flags Great Adventure and Safari is just an hour away in Jackson, NJ. You will stay in a local middle school that is fully air conditioned. You will serve a variety of residents, including residents who are still in need from the storm of 2012. Projects may include building wheelchair ramps, fixing porches, painting homes, and other home improvements that will be so appreciated. Our amazing partner has been embedded in their community through hardship and natural disaster. 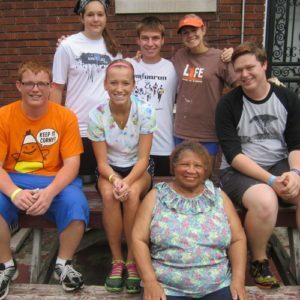 They have attended Group Workcamps and know what it takes to create an incredible experience for participants. They are deeply connected to the local community and the faith community as well.